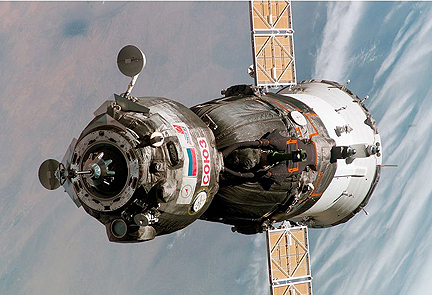 [SatNews] A Russian Soyuz spacecraft due to launch in December suffered damage to its container in transit. Engineers spotted damage to the Soyuz TMA-20's transport container after it was shipped by rail to the Baikonur cosmodrome in Kazakhstan, the president of the Energiya spaceship factory, Vitaly Lopota, told the Interfax news agency. "When we put the ship on a stand to check it over before the launch, we discovered damage, but to the container, not to the ship," Lopota said. "We will check everything, do more work on it and in December, I hope, we will fly on time," Lopota said. The Soyuz is due on December 13th to transport Russian cosmonaut Dmitry Kondratyev and NASA astronauts Catherine Coleman and Paolo Nespoli to the International Space Station (ISS). The glitch follows a technical problem with undocking the Soyuz last month that forced the outgoing crew to return to the International Space Station for 24 hours. Their delay in landing was the first in a decade of Soyuz flights. A source in the space industry told Interfax that the damage to the Soyuz container could require the ship to be sent back to the Energiya factory in the Moscow region. The head of the Russian space agency, Anatoly Perminov, will inspect the ship on Wednesday, Roskosmos spokesman Alexander Vorobyov told Interfax. The December launch date would not be affected because there is a reserve ship, which is to be sent to Baikonur, Vorobyov added.